Sleep Studies: Do You Really Need One? If you haven’t had a sleep study, you may wonder if spending the night at a sleep clinic might help the doctor understand your problem and how to fix it. Polysomnography, or PSG, is the test conducted at the clinic. New guidelines from the American Board of Internal Medicine (ABIM) clarify when PSG is useful in cases of chronic insomnia and when it isn’t. Here’s a summary and explanation of the guidelines. PSG is good at detecting sleep apnea, sleep-related movement disorders, and violent or harmful behavior that might be occurring at night. If a doctor suspects that your insomnia is associated with any of these disorders, you’ll likely be going in for a sleep study. Occasionally a person with insomnia reports such an unusual assortment of symptoms that, even after taking an extensive patient history, the doctor can’t figure out what’s going on. Here, too, PSG may help. The doctor may also prescribe a sleep study if you’ve undergone treatment for insomnia (with or without drugs) but your sleep has failed to improve. But neither the ABIM nor the American Academy of Sleep Medicine recommends sleep studies for other insomnia patients. Here are some of the reasons. 1. PSG cannot do much except confirm the symptoms you report to the doctor during a clinical interview. Let’s say you wake up several times at night and have trouble falling back to sleep. PSG may confirm that you experience these wake-ups but will not shed light on why. Or maybe your problem is that it usually takes you a long time to fall asleep. Upwards of $2,000 is a lot to spend on a procedure that merely corroborates what you already know. 2. PSG does a poor job of discriminating between normal sleepers and people with insomnia. In fact, up to 50 percent of the time, the brain activity of insomniacs looks identical to that of normal sleepers. 3. In some insomniacs, there is abnormal brain activity occurring at night—activity typically associated with being awake. But standard PSG will not show evidence of this wake-like activity. As a measure of what’s going on in the brain at night, PSG is not finely tuned. 4. Finally and importantly, in most cases of persistent insomnia, PSG will not suggest a course of treatment that differs from treatment that would be prescribed based on a thorough clinical interview. If your complaint is that you’re a light sleeper and wake up frequently at night, the doctor will probably prescribe cognitive-behavioral therapy for insomnia (CBT-I) or some other behavioral treatment before considering medication. PSG might corroborate your symptoms but would not alter the diagnosis or the treatment. Or let’s say your main complaint is that your thoughts keep you too wound up at night to fall asleep easily. The doctor isn’t going to need for you to undergo a sleep study in order to diagnose and treat the problem. Sleep studies are an indispensable tool for people suspected of having sleep apnea and many other sleep disorders. But as conducted now, they’re of no help to insomnia sufferers unless your insomnia is related to another health problem. 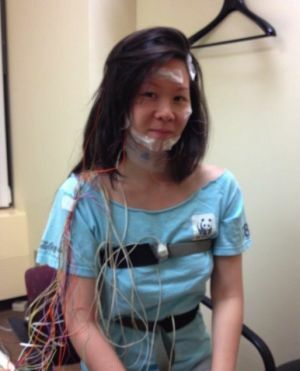 If you’ve had a sleep study, what did you learn from it? I had a sleep study earlier this year. It ruled out sleep apnea and also reported my sleep efficiency was 75%. My GP took one look at it and told me “you’re fine. There’s nothing wrong with you!” Which wasn’t much help since at that point I had gone 1.5 years on an average of 4 hours of sleep a night. I am glad I did it, but I can’t say the sleep study was very informative. I guessed it ruled out sleep apnea and restless leg syndrome for me. Your experience is similar to what I’ve heard from others. The study ruled out apnea and restless legs.